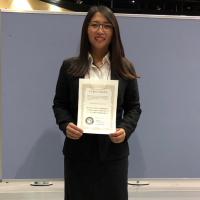 March 18, 2019 AwardSocio-environmental Energy Science Dept. 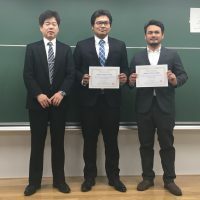 February 28, 2019 AwardSocio-environmental Energy Science Dept. 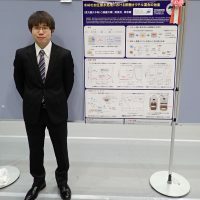 Daiki Bito, the master’s student of the Department of Socio-Environmental Energy Science, won the Best Poster Award for his presentation entitled “The addition of octyl acetate during hot-compressed water treatment of wood” in the 27th Annual Meeting of the Japan Institute of Energy held in August 2018. 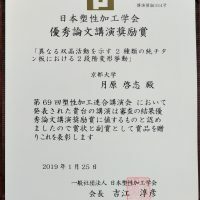 February 22, 2019 AwardSocio-environmental Energy Science Dept. February 1, 2019 AwardEnergy Science and Technology Dept. 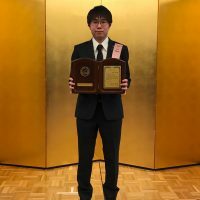 Master student Keishi Tsukihara, who belongs to the Department of Energy Science and Technology, received the Best Presentation Award for his talk entitled “Two-step deformation behavior in 2 types of commercially pure titanium sheets with different twinning activities” in The 69th Japanese Joint Conference for the Technology of Plasticity held in October 2018.